1979-06-01. New. Ships with Tracking Number! INTERNATIONAL WORLDWIDE Shipping available. Buy with confidence, excellent customer service! Cassell. Hardcover. 0304300039 New Condition. . New. Cassell. Hardcover. 0304300039 Like New Condition. . Fine. U.S.A.: Cassell, 1979. 1st Edition . Hardcover. New/New. 4to - over 9¾ - 12" tall. Foreword by Admiral of the Fleet The Earl Mountbatten of Burma, attractive pictorial dust wrapper from a Peter van der Velde painting. Covers the beginnings of sail in the 15th century until the coming of steam in the early 19th century. Cassell. Hardcover. 0304300039 . Very Good. Herndon, Virginia, U.S.A.: Cassell, 1979. Large hardback in near fine condition with very good condition dust jacket.. Hardcover. Near Fine/Very Good. Cassell. Hardcover. 0304300039 Brand new hard cover may have light shelf wear due to storage and handling . New. Book. Very Good or Better. No Binding. London: Cassell, 1979. 192 pages. 1.05Kg. Blue cloth boards FINE in a FINE d/w. Illustrated with colour and b/w photographs and drawings. Covers the beginnings of sail in the 15th century until the coming of steam in the early 19th century. Owing to the weight, extra shipping will be required.. 1st Edition. Hard Cover. Fine/Fine. 4to - over 9¾" - 12" tall. Cassell, 1979. First Edition. Hardback with dustwrapper. Very Good plus/Very Good. Light shelf wear only: slight foxing to page edges: Large 4to: (xi) 192pp including index. A history of sailing ships, built or used for warfare. " "Illustrated in colour and black-and-white with photographs, art works, line drawings, etc., etc." . ISBN: 0304300039. Littlehampton Book Services Ltd, 1979-06. Hardcover. Good. London: BCA, 1979. No marks or inscriptions. A very clean very tight copy with bright unmarked boards and minor bumping to upper corners. Dust jacket not price clipped or marked, torn or creasedwith traces of handling and slight fading to spine. 192pp. The span of this book extrends from the ousting of oared vessels by sail at the end of the fifteenth century until the complete revolution brought about by the coming of steam in the nineteenth century. Very well illustrated. . Hard Cover. Near Fine/Near Fine. 11 x 8.75 inches. London: Book Club Associates, 1979. Reprint, large 4to, 192pp, photo reproductions, VG Copy in VG DJ mildly scuffed at the very bottom tip of spine. Reprint. Hard Cover. Very Good/Very Good. 4to - over 9¾" - 12" tall. BCA [Book Club Associates - Guild Publishing] , 1979. Hardback with Dust Wrapper. Good to Very Good/Good to Very Good. Some corner bumping. Large 4to: (xi) 192pp including index. 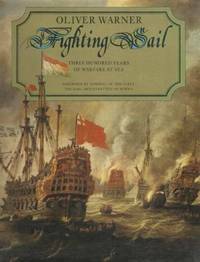 A history of sailing ships, built or used for warfare. " Illustrated in colour and black-and-white . Cassell. Used - Very Good. Great condition for a used book! Minimal wear. Littlehampton Book Services Ltd, 06/01/1979. Hardcover. Used; Good. **WE SHIP WITHIN 24 HRS FROM LONDON, UK, 98% OF OUR ORDERS ARE RECEIVED WITHIN 7-10 DAYS. We believe you will be completely satisfied with our quick and reliable service. All orders are dispatched as swiftly as possible! Buy with confidence! London : Heinemann. 1st edition. Good hbk bound in blue cloth, gilt tltle lettering. Front inner hinge weakening. . 1932. Cassell. Hardcover. GOOD. Spine creases, wear to binding and pages from reading. May contain limited notes, underlining or highlighting that does affect the text. Possible ex library copy, thatâll have the markings and stickers associated from the library. Accessories such as CD, codes, toys, may not be included.